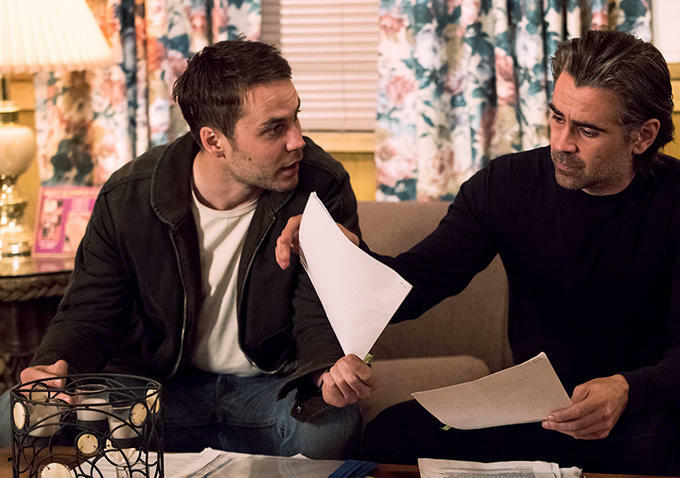 The penultimate episode of True Detective season 2 finally delivered some hard answers and revealed the roots of the Vinci conspiracy that we’ve been siting through all season long, and The Cast Beyond Carcosa is back to discuss it all. After stealing the contracts for the railway deal from last week’s party, our gang has found themselves on the run from the law. Ray discovers that he’s been framed for murdered California DA Davis, who was their only official contact who knew about the investigation. Ani, meanwhile, has an APB out for her arrest and Paul begins receiving blackmail photos from his last outing with Miguel. While the trio of cops were hot on the case, Frank had his own bit of dirty work to do. After finding out his man Blake had been working with Tony Chessani and Osep the Russian, Frank decided to take control of his clubs before everything he’d worked for slipped through his fingers. After Osep buys out his clubs, Frank takes all of the money locked in the safes before burning both places to the ground. Things get a little muddled in a quick montage of Frank making a few deals, but it looks like he’s on his way to end everyone who’s been secretly dismantling his empire before he flees the country with his wife. On The Cast Beyond Carcosa, we discuss all the biggest reveals from this week’s episode before making our predictions for who lives and who dies in next week’s 90 minute finale. There’s more than a couple ideas floating around the internet, and we take a closer look at the inconsistencies in our final segment in this year’s conspiracy corner. Have we finally cracked the case? Tune in to find out!